Awards recognize SLCC's steps to 'advance quality growth principles" in Utah and efforts to improve the lives of its residents. Salt Lake Community College officials were joined by Utah Gov. Gary Herbert (far left) in accepting an Envision Utah award for SLCC Promise. Salt Lake Community College, during an event at the State Capitol, received Envision Utah’s “Your Utah, Your Future” award for SLCC Promise, a unique program that helps qualifying students at SLCC pay for their college education. Envision Utah also recognized the Utah Aerospace Pathways program, of which SLCC is a partner. 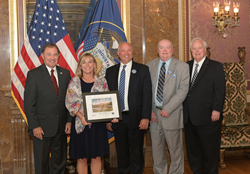 The Envision Utah award for Promise recognizes steps SLCC has taken to “advance quality growth principles” in Utah and to improve the lives of its residents. SLCC Promise helps eligible, full-time students pay for their education by covering the cost of tuition and fees when federal grants fall short. SLCC Promise has helped about 700 students, exceeding 1,000 awards worth approximately $800,000 in value since the program started last year. To be eligible for SLCC Promise funds, students first must exhaust other sources of financial aid, including federal Pell grants, VA chapter benefits, scholarships and other tuition waivers. With requirements to develop an academic plan in collaboration with an academic advisor, maintain a 2.0 GPA and attend full time, SLCC Promise is providing a pathway for students to succeed and complete their degrees at SLCC. For more information, visit http://www.slcc.edu/promise. Since 2015, the Aerospace Pathways program has been providing Utah students the opportunity to graduate high school with a certificate in aerospace manufacturing and begin a career in that field. The first semester of the program takes place in high schools while the second semester is held at SLCC and Davis Applied Technology College. Students also participate in paid internships during their senior year of high school. Upon completion of the program and after passing pre-employment requirements, students can work for program industry partners such as Boeing, Harris, Hexcel, Hill Air Force Base, Janicki or Orbital ATK. Jobs at these employers are considered to provide “family-sustaining” wages and, in some cases, include tuition reimbursement programs for continued education after working for the company for at least one year. Envision Utah is a nonprofit “neutral facilitator” that brings together “residents, elected officials, developers, conservationists, business leaders and other interested parties to make informed decisions” about how Utah should grow. Salt Lake Community College is an accredited, student-focused, comprehensive community college meeting the diverse needs of the Salt Lake community. Home to more than 60,000 students each year, the College is Utah’s leading provider of workforce development programs. SLCC is also the largest supplier of transfer students to Utah’s four-year institutions and a perennial Top 10 college nationally for total associate degrees awarded. The College is the sole provider of applied technology courses in the Salt Lake area, with multiple locations, an eCampus, and nearly 1,000 continuing education sites located throughout the Salt Lake Valley. Personal attention from an excellent faculty is paramount at the College, which maintains an average class size of 20.